EWG scientists reviewed Physicians Formula Youthful Wear Cosmeceutical Youth-Boosting Foundation + Brush, SPF 15, Medium for safety according to the methodology outlined in our Skin Deep Cosmetics Database. We assess the ingredients listed on the labels of personal care products based on data in toxicity and regulatory databases, government and health agency assessments and the open scientific literature. 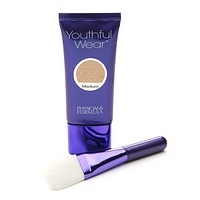 EWG's rating for Physicians Formula Youthful Wear Cosmeceutical Youth-Boosting Foundation + Brush, SPF 15, Medium is 3.
apply liberally 15 minutes before sun exposure.use a water resistant sunscreen if swimming or sweating. reapply at least ever 2 hourschildren under 6 months: ask a doctorSun Protection Measures. Spending time in the sun increases your risk of skin cnacer and early skin aging. To decrease the risk, regularly use a sunscreen with a braod spectrum SPF of 15 or higher and other sun protection measures including:limit time in sun, especially from 10 am-2 pmwear long sleeve shirts, pants, hats, and sunglassesprotect this product from excessive heat and direct sunlight. WarningsFor external use onlyDo not use on damaged or broken skinWhen using this product keep out of eyes. RInse with water to remove.Stop use and ask a doctor if rash occursKeep out of reach of children. If product is swallowed, get medical help or contact a Poison Control Center right away.